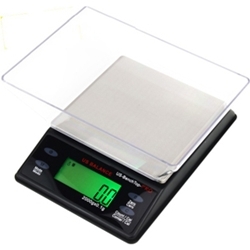 The "BenchTop PRO" digital scale manufactured by US Balance is the most heavy duty of any digital scales in our line. The Pro offers professional grade weighing and calculating at an economic price. Features a classic green backlit LCD display, stainless steel platform, and 4 button controls - so you know it's ready for any job. The parts counting function (PCS) makes it possible to count large quantities of parts of the same weight. The Pro is the largest precision weighing unit in our line in terms of both size and capacity. - Overall Size: 4.5" x 6.3" x 1.2"
- Platform Size: 3.9" x 4.1"